Who's that Blond Blogger in the perfect little black dress? Who had the most adorable British sandals? Sorry, I didn't get her name. Oh, I was so busy having fun and chatting with fellow bloggers and showing off Tall Husband that I was remiss in my blogger duties. I almost forgot to show you some Zapp Hall antiques scenery, so above is a peace offering. 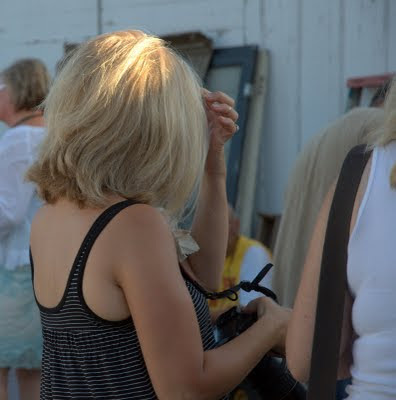 I promise to be back on the job at the Marburger Farm Antiques Show's opening Tuesday. 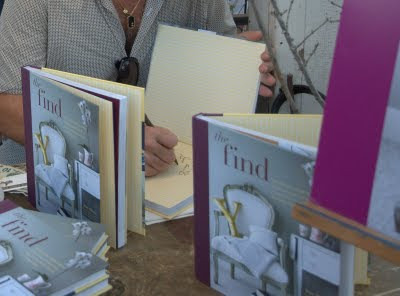 Stan Williams, (photo 3 & 4) author of "The Find," a great vintage design book in its second printing. His new blog is The Elegant Thrifter. The Vintage Laundress: Thanks for the great stories. Tall Husband and I loved meeting you and your wonderful family! The Texas Woman, thanks for sharing your stories. Keep them coming, 'cause I like knowing that you are out there! Above, photo 3, Theresa, Corey and Theresa : On the left in the photo, Theresa of Time-worn Interiors is wearing an adorable slip dress by Gypsy Brocante. Great photos Annie, and thanks for sharing them, but all I can think about is how fabulous Corey looks in that cute little sundress...good grief she has the arms of an 18 year old!!! I'm just jealous! LOL! Oh yeah, and the sandals are wonderful, too. Sure , I can name them . Corey is my friend , neighbor and above all my godblogger and the others I have met them on her blog !!! So glad you made it to the party and glad to have met you in person. Great pic too. Loved Corey, she was just so sweet!